12 months - $59.99 Only 3 left! 18 months - $59.99 Only 6 left! 2T - $59.99 Only 7 left! Remember those moments when you bring your kiddo into the mall to visit Santa and they just light up? It takes everything just to keep them from rushing up and busting through those gold-tinted or candy-cane gates and plowing through the cotton snow just to get right up there. They sometimes dodge through the line, skipping over other kids and parents who are waiting for their turn to greet Old Saint Nick… and then your kiddo is spending more time chatting up the elves than Santa? Well, there is an important truth that we often miss. How did those Mall Santas show up in the first place? Obviously, you can’t just apply to a job and get a costume and just be a part-time Santa. That isn’t how magic works! It is a slow cultivation to gain the power and trust to communicate with the big guy at the North Pole. It is, in fact, a life long process. So, we put some extra feelers into it and realized that we could help you get your tyke ready to join that magical circle of Santa-folk! 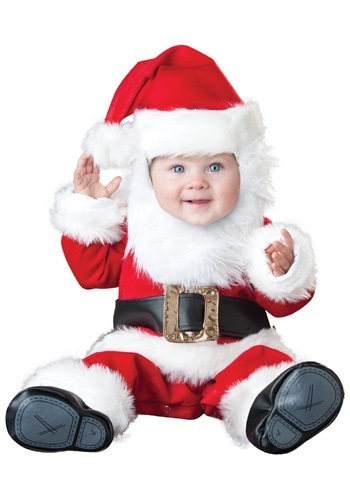 You can do so with this Santa Baby costume. Get your little kiddo familiar with the red and white with this polyester jump including white plush on the collar, hat, sleeves, waist, and the ankles. Faux leather booties make for an adorable match to the belt and fit easily thanks to the magic of elastic. The lovely red of the jumpsuit will bring out your tyke’s rosy cheeks while the fluffy beard will tickle out a few extra Ho Ho Hos, though they’re likely to come out more giggly at the beginning. Channel the magic of the season early and help your kiddo keep it year round. Join up with a Mrs. Claus or Elf costume to make it a family affair!